The Delinquent Housewife Vol. 1 Review – AiPT! In the past, she rode bikes and got up to no good. Now, she just wants to know how to fry an egg! The Delinquent Housewife Vol. 1 is the start of a series from Vertical Comics about Komugi, a former girl-gang member who’s joined her fiancé in moving into his family’s home. In terms of household skills, she’s got nothing; she can’t do laundry and doesn’t know how to cook, but she wants to show her new family that she’ll make a good addition. When her fiancé goes out of town on business, she’s forced to find new ways to cover up the fact that she has few to no adulting skills outside of motorcycle riding and troublemaking. Does the first volume of the series help Komugi make a good first impression? 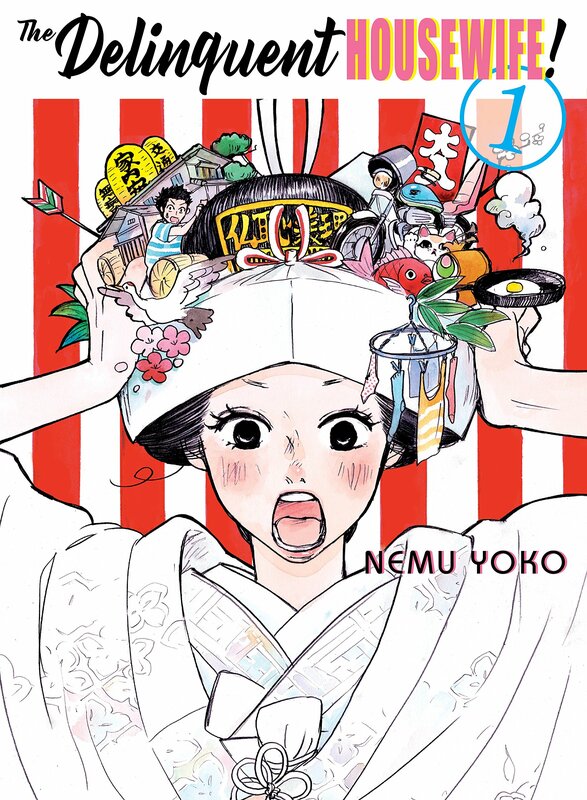 Creator Nemu Yoko’s premise of The Delinquent Housewife made me hopeful that Komugi’s past as a girl-gang member would be used to subvert expectations about women and their position in a Japanese family, but that’s sadly not what this series is about thus far. Thus far, Komugi’s goals in the series are to become as typical a housewife as she can be and while that’s a valid desire for a woman to have, her past in the biker gang is only used for comedy and contrast. Her past is something to hide and distance herself from, not because of anything bad that happened to her because of it, but because it interferes with her becoming a domestic ideal. The series is still funny enough thanks to Yoko’s work on the facial expressions, but there would’ve been more opportunities for comedy if her past as a biker was more integrated into her mannerisms and daily life, instead of as a separate persona she’s trying to suppress or hide. The volume is at its strongest during the scenes in which Komugi visits her old girl-gang friends. The way they chat about their domestic lives in a relaxed way where they can still rib each other and not worry as much over decorum made me want more of this dynamic and wish it was more integrated into Komugi’s behavior at home. Even without her friends, Nemu Yoko does a good job of conveying humor with Komugi with facial expressions that are just exaggerated enough to be funny without veering into cartoony territory. This emphasis on faces comes through in the composition of the panels, which feature few backgrounds throughout, thus letting the character renderings shine. Where the humor is most lacking is probably in the jokes from the family’s grandfather and a friend of Dai’s, the younger brother of Komugi’s fiancé. Both the grandfather and Dai’s friend make jokes focused on objectifying Komugi and while the jokes are often reprimanded, they still feel out of place with the rest of the story. Though it’s not played for humor, it’s clear that Dai and Komugi’s relationship as friendly soon to be in-laws is going to be complicated by Dai’s feelings, which is another trope I was hoping wouldn’t show up for the sake of avoiding convention. Overall, The Delinquent Housewife is a fairly straightforward comedy series. It does little to avoid convention and relies on overplayed tropes, but the characters are charming enough thanks to Yoko’s funny artwork. Readers looking for a quick, light series and a few laughs should be able to enjoy The Delinquent Housewife just fine. A trend towards convention and the use of overplayed tropes hold this comedy series back from feeling really original, though the artwork inspires a few laughs. When Komugi and her girl-gang friends are hanging out, the characters are at their most interesting and relatable. Facial expressions are exaggerated enough to be funny without going over the top. The series does little to subvert gender expectations, instead sticking to comedy that comes from trying to suppress that subversion for the sake of following a typical, domestic ideal. There are some objectifying jokes that feel out of place in the story. It’s clear the story is hinting at Dai’s feelings complicating his relationship with Komugi, invoking an overplayed trope.